Zachary Keck, managing editor of American magazine The National Interest, posted an article titled “No, China Can NOT Shoot Down 90% of Hypersonic Missiles” to refute media reports on Chinese Type 1130 warship gun’s capability to intercept hypersonic missiles. What he says about hypersonic weapons is entirely correct, but his conclusion tht the gun cannot even intercept subsonic missile shows his ignorance about the weapon. I described the gun in my post “China’s New Warship Gun Able to Intercept 4-mach Anti-ship Missile” on January 14, 2013 based on Chinese government’s mouthpiece people.com.cn’s report “Our country’s new-type warship gun world advanced, perhaps able to intercept mach-4 anti-ship missiles”. We all know that due to Chinese military’s habit to keep secret about its advanced weapons, such official description of China’s advanced weapon is rare. Moreover, as the report caters Chinese people, there is no need to exaggerate. The report is quite long and gives details of the reasons for and course of the development of the gun. It compares Type 1130 gun with its US counterpart and describes where it is better. I only gave a short summary. I wonder whether US intelligence monitors Chinese media carefully. Obviously, American people are ignorant about China’s progress in its arms race with the US and perhaps they do not even know that there is such an arms race. That is why even such an expert as Zachary Keck mentions only Taiwan and other countries’ sources instead of Chinese ones. Underestimate of its enemies has been the major cause for US failures in the wars in Korea, Vietnam, Iraq and Afghanistan. When US general took the enemy seriously and did not enter enemy’s territory until the US had overwhelming superiority, the US won landslide victory in the Gulf War. If the US rests at ease that it can destroy Chinese navy with subsonic missiles while China is developing hypersonic anti-ship missiles, it will add one more fairlue to quite a few past ones. I wrote my book Space Era Strategy: The Way China Beats the U.S. to warn American people. I did so in order that there will be balance of strength in the world to avoid war, but perhaps the US is destined to decline, no one can prevent that. A number of media outlets have reported in recent days that China has deployed a new missile defense system on many of its ships that has a 90 percent success rate against hypersonic missiles. The same reports also unwittingly highlight that this assertion is false. There are a number of issues with all this. The first, and least egregious, is that the Type 1130 CIWS system is not particularly new. In fact, it was first noted by Western defense analysts as far back as May 2011, albeit at the time it was still in development and referred to as the Type 1030. However, by the time China’s aircraft carrier, the Liaoning, began sea trials the following year, the gun-based CIWS was being called by its current name (noted, the Type 1130 is also called the H/PJ-14). Thus, at the very least, the Type 1130 is about two and a half years old. Far more importantly, however, by these reports own admission, the Type 1130 CIWS can’t shoot down hypersonic missiles. As noted above, these reports claim that the Type 1130 CIWS can target missiles traveling at up to four times the speed of sound, or Mach 4. As impressive as these reports make Mach 4 out to be, it doesn’t reach hypersonic levels. To constitute hypersonic, the missile must travel at five times the speed of sound (Mach 5) or greater. NASA further categorizes speeds as hypersonic (between Mach 5 and Mach 10) and high hypersonic (between Mach 10 and Mach 25). This oversight— calling Mach 4 hypersonic— is particularly surprising given that it was featured on science and technology websites Gizmodo and Engineering.com. There are other smaller issues with the claims as well. For example, no country currently deploys hypersonic missiles, raising the question of how the Type 1130 achieved its 90 percent success rate in shooting them down. In fact, it’s unclear where the 90 percent success rate statistic comes from at all, although one possible culprit is a report by a Chinese state-run television station. Needless to say, this is another source that should be taken with a grain of salt. Finally, while no country currently deploys hypersonic missiles, any that China’s potential adversaries like the United States would deploy in the foreseeable future are almost certainly going to be long range missiles (for example, as part of Prompt Global Strike). Since the Type 1130 CIWS can’t even shoot down medium or long-range subsonic missiles it’s a good bet that it will struggle with hypersonic ones. People.com.cn reported on October 9 that according to Hubei TV news, since 2006 twenty 054A frigates have been launched. Among them, sixteen have been commissioned. They are armed with different weapon systems since series production began. Some of them have been installed with anti-submarine towed array sonar system. New frigates are armed with the newest Type 1130 close defense gun able to shoot at the speed of 10,000 rounds per minute. 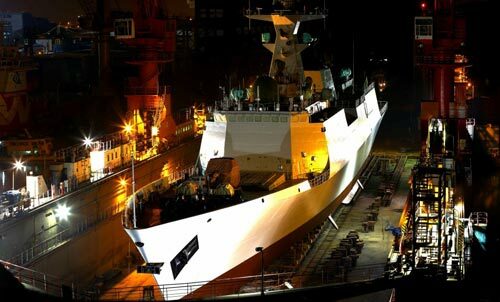 It is said that China’s 20th 054A frigate was launched at night in mid July. Judging by the photos published by Chinese media, no number has been painted on the vessel, but it has been installed with all equipment including radar and cannons. There have been improvement in equipment while new 054A is turned out. Its towed array sonar system has been expanded and its Type 730 close defense gun has been replaced by Type 1130 one with double speed of firing to provide better defense against missiles coming near it. The frigate can serve as a member of an aircraft carrier battle group as it is installed with 32 vertically launched Haihongqi-16 air-defense missiles and 8 Yingji-83 anti-ship missiles that can be launched vertically. Its radar monitors an area within 260 km around it and is able to track 100 targets and select 10 most dangerous targets to hit. When China’s aircraft carrier the Liaoning was berthed in Qingdao last April, it is convoyed by two 054A frigates.